Use the Element Manager to add, delete or modify elements (drawing folders) in your scene. If you have drawing folders that are not linked to a column in your scene, use the Element Manager to delete them if need be. ‣ Select Scene > Element Manager. • Elements: Displays a list of the elements contained in your scene. • Delete Elements: Press this button to delete the selected elements. • Delete Elements and Directories: Press this button to delete the selected layer, as well as its directories (drawing folder). • Add/Modify Element: Use the options contained in this area to add or modify an element. • Name: Type a new name in this field to create an element or to rename the selected element. • Vector: Check this box if the new element is a vector drawing or if you want to enable the parameters on the selected element in the Elements list. 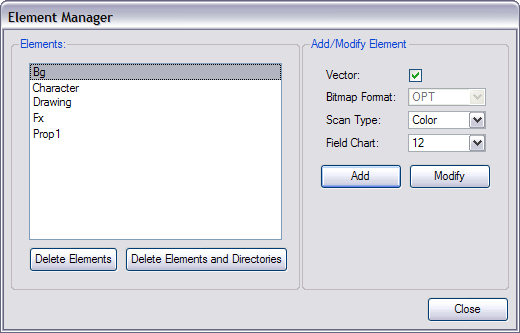 • Bitmap Format: Select the file format of the bitmap layer from the drop-down list. • Scan Type: If you are planning to scan elements with Toon Boom Harmony’s Scan module, select the scan type from the drop-down list. • Field Chart: If you are importing traditional animation, select the size of the paper on which the animation was drawn. • Add: Press this button to create a new element with the current parameters entered in the Add/Modify Element section. • Modify: Press this button to apply the parameter changes made to the selected element.